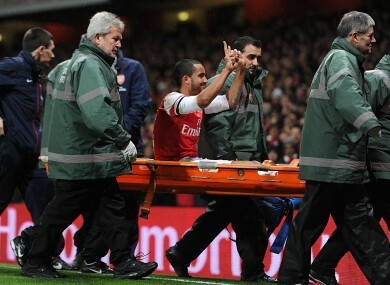 Walcott gestures to Spurs fans while being stretchered off. ENGLAND’S THEO WALCOTT will miss this year’s World Cup in Brazil after being ruled out for at least six months with a knee injury, his club, Arsenal has revealed. Walcott suffered a ruptured anterior cruciate ligament of his left knee during Arsenal’s 2-0 FA Cup win at home to arch north London rivals Tottenham Hotspur on Saturday. An Arsenal statement said Walcott is “expected to be out for at least six months, therefore missing the remainder of the (English) season and the World Cup in Brazil in the summer”. Meanwhile, the FA have decided against punishing Walcott for his gesture signalling the scoreline during Saturday’s FA Cup third round win over Tottenham. The Gunners forward made a ’2-0′ sign with his hands while being taken off injured at the Emirates which resulted in coins being thrown in his direction. But the FA this afternoon released a statement to reveal that no action will be taken. “The FA has contacted both Arsenal and Tottenham to seek their observations in relation to objects being thrown from both a home and away section of the crowd at different times during Saturday’s FA Cup tie,” the statement reads. The FA condemns any such acts and will liaise with both clubs and the Metropolitan Police to identify those responsible and support the strongest sanctions available, including life bans. “Meanwhile, in relation to the same fixture, The FA has contacted Arsenal’s Theo Walcott and reminded him of his responsibilities regarding a ‘scoreline’ gesture he made in front of away supporters during the game. Email “Walcott to miss World Cup after rupturing knee ligaments”. Feedback on “Walcott to miss World Cup after rupturing knee ligaments”.